Preprints (earlier versions) of this paper are available at http://preprints.jmir.org/preprint/159, first published Dec 31, 2004.
: EHealth has developed largely from an interdisciplinary framework and, as such, does not have a “home” discipline. The absence of this home discipline has allowed eHealth research to be published widely in journals ranging from the medical sciences, to engineering, to social science or to business and policy studies. The result of this fragmented, decentralized literature base is that researchers are not always aware of important papers published in other areas and journals. With this issue the Journal of Medical Internet Research is inaugurating a new article category which we call “CATCH-IT Reports” (Critically Appraised Topics in Communication, Health Informatics, and Technology). We hope these reports will draw attention to important work published in other (sometimes obscure) journals, provide a platform for discussion around results and methodological issues in eHealth research, and help to develop a framework for evidence-based eHealth. CATCH-IT Reports arise from “journal club” - like sessions founded in February 2003 at the Centre for Global eHealth Innovation. We invite other research institutions to create similar journal clubs and to write up and submit to this journal critiques in the form of CATCH-IT Reports. While health informatics is widely seen as a discipline with the potential for making health care more effective by advancing the introduction of medical evidence into clinical practice, information professionals are not always known for their optimal utilization of research findings in their own area of specialization. One of the barriers for keeping on top of research findings in health informatics is that even for information professionals trained in retrieving, organizing, and filtering information, it is difficult to keep pace with the scattered literature in this rapidly expanding field. With information technology having penetrated virtually every field of medicine, pertinent papers appear scattered in many different journals. in particular if we consider the broad definition of medical informatics as “the field that deals with the storage, retrieval, and optimal use of biomedical information, data, and knowledge for problem solving and decision making or in information delivery” , or the even broader definition of “eHealth”, which would also include for example papers dealing with the role of the Internet for information dissemination, data collection, and decision making for health professionals and consumers, and impact of the Internet on health behavior and well-being of people with a public health focus [2, 3]. In a search conducted on December 30, 2004 for journal articles published in 2003/2004 with “Internet” as a major MeSH keyword, we identified 1702 papers. (Note that at this time not all 2004 articles are yet Medline-indexed; thus this data contains only a subset of the papers published in 2004. We also excluded 70 articles published in Internet Healthcare Strategies as this journal does not publish original papers). The 1702 papers were scattered across 685 different journals (Table 1 lists the top 20 journals publishing most of the papers). Reading the top two journals in this field (Journal of Medical Internet Research and Cyberpsychology & Behavior: the Impact of the Internet, Multimedia and Virtual Reality on Behavior and Society) as well as the two proceedings volumes from major medical informatics conferences (the proceedings of the American Medical Informatics Association fall conferences, and the conference proceedings of the European Federation of Medical Informatics Studies in Health Technology and Informatics) would keep readers informed of approximately 10% of the work published in this area. One would have to read papers in 36 different journals to cover 33% of the articles, 92 different journals to cover 50%, 190 journals to cover 66%, and 344 journals to cover 80% of all articles (Figure 1). While such a distribution, where a small group of core journals would provide 1/3 of the articles on that subject, a medium number of less-core journals would provide another 1/3 of the articles on that subject, and a large number peripheral journals would provide the final 1/3 of the articles on that subject, is typical (known as “Law of Scatter” or “Bradford's Distribution”), the extent of scatter in the field of eHealth is extreme, with a very long tail. 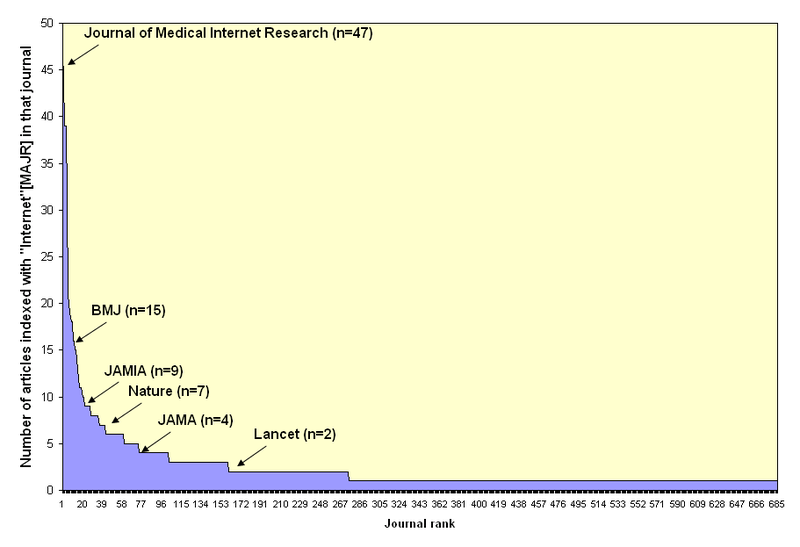 While the Journal of Medical Internet Research ranks as the top journal which published more papers related to the Internet in medicine than any other journal, it still “only” publishes about 3% of the total number of papers in this field (which, by the way, we hope are the best 3%, and which is a proportion we hope to increase significantly over the next years). Figure 1. Information scatter in eHealth: Distribution of “Internet”-related papers published in 2003/2004 by journal (with some prominent journals highlighted). While the Journal of Medical Internet Research attracts more pertinent papers in this field than any other journal, the majority of the literature remains scattered (this figure does not even take into account non-Medline indexed journals e.g. from engineering or the social sciences). It becomes clear that one has to monitor a large number and broad spectrum of journals in order to stay abreast of the most important developments in the evolving field of eHealth. EHealth is in a unique position in that it has developed largely from an interdisciplinary framework and, as such, does not have a “home” discipline (even “medical informatics” is only a part of the broader eHealth scene). The absence of this home discipline has allowed eHealth research to be published widely in journals ranging from the medical sciences to engineering, to social sciences and to business and policy studies. The aforementioned analysis does not even take into account articles published in journals which are not indexed in Medline. The result of this fragmented, decentralized literature base is that researchers are not always aware of important papers published in other disciplines and journals. With this issue, the Journal of Medical Internet Research is inaugurating a new article category which we call “CATCH-IT Reports” (Critically Appraised Topics in Communication, Health Informatics, and Technology). With this new article series we hope to draw attention to important work published in other (sometimes obscure) journals, and provide a platform for discussion around methodological issues in eHealth research. To identify pressing research issues and to stimulate thinking about methodological issues in eHealth. The CATCH-IT review group at the Centre for Global eHealth Innovation comprises individuals who all have experience in developing, deploying and evaluating eHealth interventions. What we lack in terms of length of experience (as we all do in this new field) we make up for in breadth of experience. Our group consists of researchers and practitioners from many different disciplines, cultures, ages, and roles. We are scientists, practitioners, professors, and students. All of us are consumers. Some of us are new to the process of critical appraisal of research while others have been at the forefront of developing methods for evidence-based medicine since the term was first coined. In short, we represent a diverse cross section of eHealth consumers. Each session is prepared by one of the participants taking on the role of facilitator. The facilitator selects a recent paper from the current body of literature (as a guideline it should not be older than 6 months, in exceptional cases up to 12 months) and circulates the paper to all participants at least 1 week before the CATCH-IT session. Direct impact on ongoing research (of the facilitator or elsewhere). Why is the paper interesting, why was it picked? For whom is this paper interesting, and why? What were the intervention, setting, outcome measures, results, and conclusions of the authors? What are the methodological issues, and is the result valid? What can health professionals learn from this study? What can consumers learn from this study? What can policy makers learn from this study? What can researchers learn from this study? What questions for the author arise? One of our goals is to produce reports based on our discussions and reviews in order to promote better research and to foster further debate and discussion on ways to create the best evidence for the use of eHealth. The focus of the first report, published in this issue , is on the article's contribution to our understanding of eHealth - it's efficacy, effectiveness or potential use in research. We also hope that from this work we will be able to compile some guidelines for specific eHealth methodologies and approaches to development and evaluation of eHealth innovations. This is not to suggest that guidelines for evaluating eHealth research do not exist. The CONSORT statement , the guidelines for interactive health communication from SciPICH3 , and many discipline-specific research guidelines all offer us some clues on what to look for when evaluating these articles. It is our hope that, over time, we can further refine such guidelines to meet the changing climate of eHealth, and perhaps work on specific guidelines for particular problems, such as the CHERRIES statement for Web-based survey research . While forthcoming CATCH-IT papers will be primarily produced by graduate students and faculty at the Centre for Global eHealth Innovation, we invite other research institutions to create similar journal clubs and to write up and submit critiques and discussion pieces of the current eHealth literature in the form of CATCH-IT Reports. Eng TR. The e-Health landscape: A terrain map of emerging information and communication technologies in health and health care. Princeton, NJ: The Robert Wood Johnson Foundation; 2001. © Gunther Eysenbach, Cameron Norman. Originally published in the Journal of Medical Internet Research (http://www.jmir.org), 31.12.2004. Except where otherwise noted, articles published in the Journal of Medical Internet Research are distributed under the terms of the Creative Commons Attribution License (http://www.creativecommons.org/licenses/by/2.0/), which permits unrestricted use, distribution, and reproduction in any medium, provided the original work is properly cited, including full bibliographic	details and the URL (see "please cite as" above), and this statement is included.